Third & Harrison’s floor plates are each approximately one acre. The rooftop terrace features Holland America’s test kitchen and sweeping views of Elliott Bay and the Olympic Mountains. Framing the attractive neighborhood views and welcoming daylight into the offices, Perkins+Will selected Wausau Window and Wall Systems’ curtainwall and windows. Achieving the intended aesthetic, Wausau provided more than 30,000 square-feet of 7250-UW INvision™ unitized curtainwall, factory-assembled and -glazed to expedite installation on site. Strategically placed exterior shading devices reduced solar heat gain, while creating an exciting visual effect. Elsewhere on the façade, Okalux® light-diffusing glass was shipped to Wausau’s factory from Marktheidenfeld, Germany. 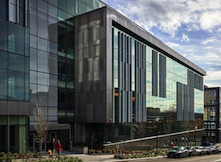 The glass was factory-glazed into the curtainwall units used in the two-story stairwell areas above the south building entrance. Wausau 6250 and 7250 Series SuperWall™ system, and 123 units of Wausau’s 3250i INvent™ Series energy-efficient windows rounded out the list of products provided. Supporting the project’s energy-efficiency goals, Wausau’s window system featured polyamide thermal barriers, applied by Linetec. This improves thermal performance, while maintaining the structural and long-term durability of the window unit. As a global leader in delivering energy and related performance ratings and certification for fenestration products and systems, the National Fenestration Ratings Council (NFRC) approved Wausau as a Manufacturer Approved Calculation Entity Organization under the Component Modeling Approach (CMA) Certification Program. Using the CMA software tool (CMAST) Wausau can generate code-mandated CMA Bid Certificates and Label Certificates for the framing systems. Further contributing to the project’s sustainability goals, the aluminum used to produce Wausau’s curtainwall and window systems is a high recycled-content aluminum billet composition with durable finishes by Linetec. On the aluminum framing members, Linetec used a three-coat, Pewter color, 70 percent polyvinylidene fluoride (PVDF) resin-based liquid paint. Custom covers were finished in a two-coat, Platinum color, mica coating. Applied under Linetec’s stringent factory-controlled processes, these finishes meet the American Architectural Manufacturers Association’s (AAMA) 2605 industry standards, as well as maximize buildings’ long lifecycles and minimize maintenance costs. Lease Crutcher Lewis broke ground in Dec. 2015. Herzog Glass began installing Wausau’s curtainwall and windows in Feb. 2016, and completed the work on schedule in September. Tenant fit-out was completed in December 2016.